Self Cleaning. Multi Action. Maintenance Free. 1045 Carbon Steel Cold Formed, No breakage of tines and high strength. Tine Diameter 7/16", 1/2" or 5/8"and 4" Long Tines. No lubrication or Adjustment required. Available in width 4, 6, 8, and 10 feet and can be combined together to make width sizes 12, 14, 16, and 18 feet. Pyramid together for width 20 and 24 feet. 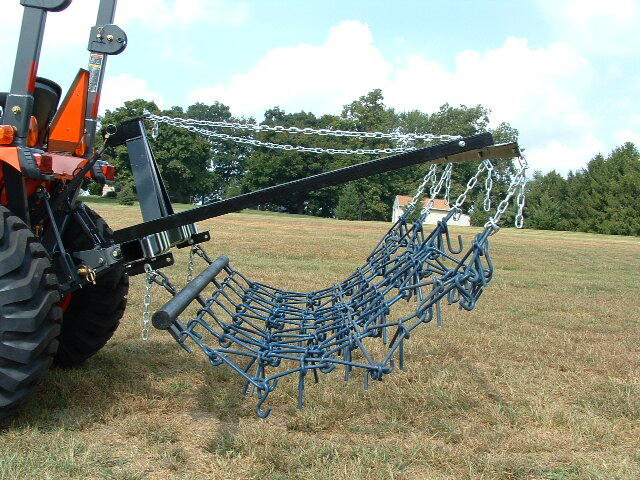 Comes in two 4' long harrow sections to make 8' long multi mode harrow. Draw Bars available 4, 6, 8, 10, 12, 14, 16, and 18 feet.